CLAAS KGaA mbH, Harsewinkel / CLAAS of America Inc., Omaha, NE / BayWa AG, München: CLAAS Expands Service in Alberta. BayWa AG, Munich, one of the leading international trading and services groups in agriculture and CLAAS, Harsewinkel, the international agricultural machinery manufacturer, announced their intentions to begin cooperatiing in Canada. The partnership will focus on growing the business for CLAAS products in the province of Alberta. 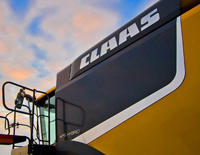 BayWa and CLAAS plan to enhance the dealer presence in the region. The initial new location will open later this year as the first phase of the cooperation. “For BayWa, this cooperation in Canada is perfectly in line with our internationalization strategy. In addition to our grain trading and fruit business, BayWa can now take a step into a new market to achieve a more diversified international business, also in the agricultural equipment business area,” explained Klaus Josef Lutz, Chief Executive Officer of BayWa AG.